organize or "calibrate" the way the brain processes the basic bits of information it receives from the senses. Just 15 minutes twice a day helps your brain's neural network absorb and process information more easily and efficiently. and 30 years of detailed study. It is not a tutorial program, computer tool, software product or in-clinic curriculum. Anyone, child or adult, can improve their cognitive abilities and work to meet their innate potential by performing our "brain fitness" activities twice daily. 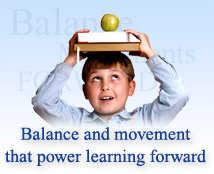 Aided by a DVD that shows exactly how to perform each and every "exercise", LBP is the most powerful home-based learning aid available anywhere at any price. Because the Learning Breakthrough Program™ improves brain function at such a root level, it is used to great effect in many areas of human endeavor. 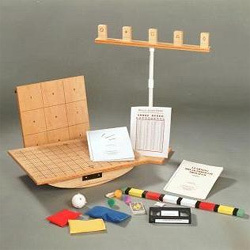 It is a "brain gym in a box" that is useful for every person that uses it but, because of obvious performance gaps, is particularly effective for those with learning difficulties and attention disorders such as Dyslexia and Attention Deficit Disorder (ADD) or Attention Deficit Hyperactivity Disorder (ADHD) as well as Autism Spectrum Disorders, Aspergers Syndrome and those seeking an edge in the sports world or as a remediation tool for a host of physical and neuro-motor challenges. After being used in clinics, schools and hospitals with great success for the past three decades, we are thrilled to make this fun to use balance and sensory processing tool affordably available to all! The world of brain science is changing as academic understanding of how we learn and how the brain continues to grow and develop after childhood becomes more clear. Many creative approaches like ours are demonstrating how grades, attention problems and even gifted performance can be enhanced without the use of medications or, even in conjunction with them. The Learning Breakthrough Program™ works with the brain in the same way that weight lifting works to build muscles and strength through repetition and increased difficulty. It is as effective for adults and the elderly as it is for children, both challenged and gifted. Reading, mathematics, auditory control, school work, business focus, impulsivity control, behavior, memory recall, comprehension of verbal and written materials, physical coordination and hand writing should all be as automatic as riding a bike once you learn. But for many people these tasks are not automatic. As the understanding of the principles that underpin learning become understood by science, there is growing acceptance that safe physical exercises can have a dramatic affect on many of the cognitive skills crucial to our quality of life. The idea is to affect basic brain function by getting sensory centers working together efficiently through focused, sequential and sensory integrative tasks. The feedback (from precise balance and movement requirements) and repetition delivered by the program increases and smoothes out neuro transmission through the brain's delivery system, the neural pathway network. This concept is called neuro-plasticity and is also known to professionals as physical intelligence or educational kinesiology. The LBP serves as a superior and dramatically less expensive option for those looking at certain "achievement centers" that have sprung up around the world and whose home-based treatment regimen is based on the activity examples provided by our Learning Breakthrough Program™. The benefits you receive from our program, or any other activity program, will be a direct result of your effort and commitment. Please do not be misguided into thinking that only certain types of "customized", very expensive motor skills activities can be beneficial. The structured nature of the updated program allows the average family access to the benefits of a program that has historically been available only to trained professionals. The program arrives with easy to follow instructions, high quality equipment and a work-along DVD. Please click here to see the details on our pricing page. In the hands of a developmental or therapeutic specialist, the Learning Breakthrough Program™ can be used "out-of-the-box" or tailored to specific client needs. It is wonderful when prescribed for daily client use, at home, in support of therapy goals and as a wonderful "brain fitness" tool when therapy ends. The program is applied in a range of scientific disciplines and its basic operating principles have been adapted in part or in whole within the fields of psychiatry, psychology, occupational therapy, physical therapy, optometry, audiology, neuro-physiology, neurology, chiropractic, sports medicine, brain and stroke rehabilitation and others. This website provides an abundance of information so that visitors can access data directly and draw their own conclusions. We hope that you notice our approach as one of an open and complementary nature and that you will avail yourself of the promise that Learning Breakthrough holds for reaching one's potential. Our mission is to help all who are willing to work at it achieve their very best. Be sure to view the video presentations where you will hear from real parents, teachers, professionals and users.